This is the noblest of all trees, and is placed in the midst of Paradise: It is the Cross, dazzling in its exceeding beauty, which Helen, the mother of Constantine, sought after with all the ardour of her soul. On it, the Author of our salvation vanquished, by his own Death, the death of all men, alleluia. He that overcame mankind by a Tree, was overcome by a Tree. O great work of mercy! Death then died, when life died on the Cross. Alleluia. The Roman Church has the following Responsories and Antiphons in her Office for this Feast. They are full of unction, and breathe a fragrance of antiquity. *On which our Redeemer broke the bonds of death, and overcame the crafty serpent, alleluia. ℣. Hanging on this Wood, the Word of the Father found the way of our salvation. *On it, the Author of our salvation vanquished, by his own Death, the death of all men, alleluia. ℣. It is the Cross, dazzling in its exceeding beauty, which Helen, the mother of Constantine, sought after with all the ardour of her soul. *The divine prodigies that, of old, were prefigured in the rod of Moses, were renewed, alleluia. ℣. The dead rose again by the contact of the Cross, and the wondrous works of God were made manifest. Ant. Save us, O Saviour Christ, by the power of the Cross! O thou that didst save Peter on the waters, have mercy on us, alleluia. Ant. Behold the Cross of the Lord! flee, ye his enemies, for the Lion of the tribe of Juda, the Root of David, hath conquered, alleluia. Ant. O Tree, loftier than all cedars! whereon hung the Life of the world, and Christ triumphed, and Death conquered death for ever, alleluia. Ant. O Cross! Brighter than all stars, honoured throughout the world, beloved by men, holiest of holy things that alone wast worthy to bear the ransom of the world! O sweet Wood! O sweet Nails! that bore so sweet a Weight!—save the people assembled here, this day, to sing thy praise! Alleluia, alleluia. O God, who, in the miraculous discovery of the holy Cross, wast pleased to renew the wonders of thy passion: grant, by the ransom paid on that saving wood, we may find help for the obtaining life eternal. Who livest and reignest, world without end. Amen. It was most just that our Divine King should show himself to us with the sceptre of his power, to the end, that nothing might be wanting to the majesty of his empire. This sceptre is the Cross; and Paschal Time was to be the Season for its being offered to him in glad homage. A few weeks back, and the Cross was shown to us as the instrument of our Emmanuel's humiliation, and as the bed of suffering whereon he died; but, has he not, since then, conquered Death? and what is his Cross now, but a trophy of his victory? Let it then be brought forth to our gaze; and let every knee bend before this sacred Wood, whereby our Jesus won the honour and praise we now give him! On the day of his Birth at Bethlehem, we sang these words of the Prophet Isaias: A Child is born unto us, and a Son is given unto us, and his government is upon his shoulder. (Isaias, ix. 6) We have seen him carrying this Cross upon his shoulder, as Isaac carried the wood for his own immolation; but now, it is no longer a heavy burthen. It is shining with a brightness that ravishes the eyes of the Angels; and, after having received the veneration of man, as long as the world lasts, it will suddenly appear in the clouds of heaven, near the judge of the living and the dead,—a consolation to them that have loved it, but a reproach to such as have treated it with contempt or forgetfulness. Our Saviour did not think the time between his Resurrection and Ascension a fitting one for glorifying the Instrument of his victory. The Cross was not to be brought into notice, until it had subjected the world to Him whose glory it so eloquently proclaimed. Jesus was three days in the tomb; his Cross is to lie buried unknown to men, for three centuries: but it is to have its Resurrection, and the Church celebrates this Resurrection to-day. Jesus would, in his own good time, add to the joy of Easter by miraculously revealing to us this sacred monument of his love for mankind. He intrusts it to our keeping,—it is to be our consolation,—as long as this world last: is it not just, that we should love and venerate it? Never had Satan's pride met with a humiliation like that of his seeing the instrument of our perdition made the instrument of our salvation. As the Church expresses it in her Preface for Passiontide: “he that overcame mankind by a Tree, was overcome by a Tree” Thus foiled, he vented his fury upon this saving Wood, which so bitterly reminded him, both of the irresistible power of his Conqueror, and of the dignity of man who had been redeemed at so great a price. He would fain have annihilated the Cross; but knowing that this was beyond his power, he endeavoured to profane it, and hide it from view. He therefore instigated the Jews to bury it. At the foot of Calvary, not far from the Sepulchre, was a deep hole. Into this was the Cross thrown, together with those of the two Thieves, the Nails, the Crown of Thorns, and the Inscription, or Title, written by Pilate. The hole was then filled up with rubbish and earth, and the Sanhedrim exulted in the thought of its having effaced the memory of the Nazarene, who could not save himself from the ignominious death of the Cross. Forty years after this, Jerusalem was destroyed by the Romans,—the instruments of God's vengeance. The Holy Places were desecrated by the idolators. A small temple to Venus was erected on Calvary, and another to Jupiter over the Holy Sepulchre. By this, the pagans intended derision; whereas, they were perpetuating the knowledge of two spots of most sacred interest. When peace was restored under Constantine, the Christians had but to remove these pagan monuments, and their eyes beheld the holy ground that had been bedewed with the Blood of Jesus,—and the glorious Sepulchre. As to the Cross, it was not so easily found. The sceptre of our Divine King was to be raised up from its tomb by a royal hand. The saintly Empress Helen, Constantine's Mother, was chosen by heaven to pay to Jesus,—and that, too, on the very spot where he had received his greatest humiliations,—the honours which are due to him as the King of the world. Before laying the foundations of the Basilica of the Resurrection, this worthy follower of Magdalene and the other holy women of the Sepulchre was anxious to discover the Instrument of our Salvation. The Jews had kept up the tradition of the site where it had been buried: the Empress had the excavations made accordingly. With what holy impatience must she not have watched the works! and with what ecstacy of joy did she not behold the Redeeming Wood, which, though not, at first, distinguishable, was certainly one of the three Crosses that were found! She addressed a fervent prayer to the Saviour, who alone could reveal to her which was the trophy of his victory; the Bishop, Macarius, united his prayers with hers; and their faith was rewarded by a miracle, that left them no doubt as to which was the true Cross. The glorious work was accomplished, and the Church was put in possession of the instrument of the world's Redemption. Both East and West were filled with joy at the news of this precious discovery, which heaven had set on foot, and which gave the last finish to the triumph of Christianity. Christ completed his victory over the Pagan world, by raising thus his Standard,—not a figurative one, but his own real Standard,—his Cross, which, up to that time, had been a stumbling-block to the Jews, and foolishness to the Gentiles; but before which every Christian is, henceforth, to bend his knee. Helen placed the Holy Cross in the Basilica that had been built by her orders, and which covered both the glorious Sepulchre and the hill of the Crucifixion. Another Church was erected on the site, where the Cross had lain concealed for three hundred years, and the Faithful are enabled, by long flights of steps, to go down into the deep grotto, which had been its tomb. Pilgrims came, from every part of the world, to visit the hallowed places, where our Redemption had been wrought, and to venerate the sacred Wood of the Cross. But God's merciful providence willed not that the precious pledge of Jesus’ love for mankind should be confined to one only Sanctuary, however venerable it might be. Immediately after its discovery, Helen had a very large piece cut from the Cross; and this fragment she destined for Rome, the new Jerusalem. The precious gift was enshrined in the Basilica built by her son Constantine in the Sessorian garden, and which was afterwards called the Basilica of Holy-Cross-in-Jerusalem. By degrees, other places were honoured by the presence of the Wood of the Holy Cross. So far back as the 4th Century, we have St. Cyril of Jerusalem attesting that many of the Pilgrims used to obtain small pieces of it, and thus carried the precious Treasure into their respective countries; and St. Paulinus of Nola, who lived in the same Century, assures us that these many gifts lessened not the size of the original Relic. In the 6th Century, the holy Queen, St. Radegonde, obtained from the Emperor Justin 2nd a large piece from the fragment that was in the imperial treasury of Constantinople. 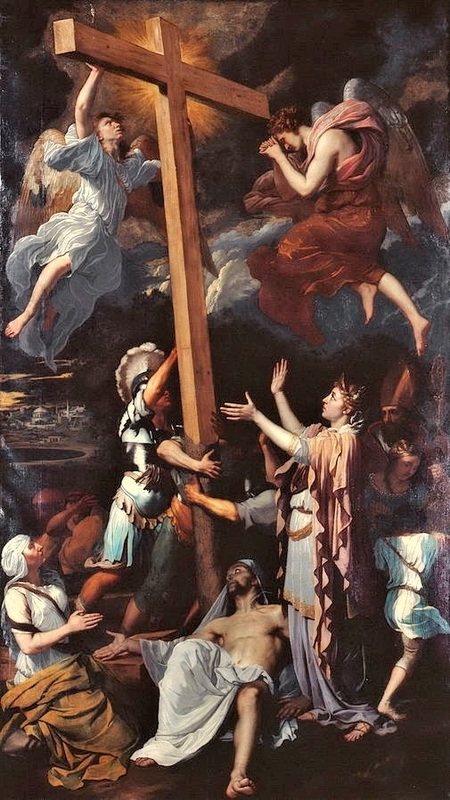 It was for the reception of this piece of the True Cross into France, that Venantius Fortunatus composed the Vexilla Regis,—that beautiful Hymn which the Church uses in her Liturgy, as often as she celebrates the praises of the Holy Cross. After several times losing and regaining it, Jerusalem was, at length, for ever deprived of the precious Relic. Constantinople was a gainer by Jerusalem's loss. From Constantinople, especially during the Crusades, many Churches of the West procured large pieces. These again supplied other places; until, at length the Wood of the Cross was to be found in almost every town of any importance. There is scarcely to be found a Catholic, who, some time or other in his life, has not had the happiness of seeing and venerating a portion of this sacred object. How many acts of love and gratitude have not been occasioned by this? And who could fail to recognise, in this successive profusion of our Jesus’s Cross, a plan of divine providence for exciting us to an appreciation of our Redemption, on which rest all our hopes of eternal happiness? How dear, then, to us should not this day be, which blends together the recollection of the Holy Cross and the joys of the Resurrection of that Jesus, who, by the Cross, has won the throne to which we shall soon see him ascend! Let us thank our Heavenly Father for his having restored to mankind a treasure so immensely precious as is the Cross. Until the day comes for its appearing, with himself, in the clouds of heaven, Jesus has intrusted it to his Spouse, as a pledge of his second Coming. On that day, he, by his divine power, will collect together all the fragments; and the Tree of Life will, then, gladden the Elect with its dazzling beauty, and invite them to eternal rest beneath its refreshing shade. The Liturgy gives us the following history of the great event we are celebrating to-day. After the great victory gained over Maxentius by the Emperor Constantine, under the standard of our Lord’s Cross, which had been miraculously shown to him,—Helen, his mother, was told in a dream to repair to Jerusalem and search for the true Cross. Upon her arrival, she ordered to be taken down a marble statue of Venus, which had been erected by the Pagans, some hundred and eighty years before, in order that all memory of our Lord’s Passion might be obliterated. She did the same for the place where there reposed the Saviour’s Crib, as also for the site of the Resurrection; removing from the former an idol of Adonis, and from the latter an idol of Jupiter. The place, where the Cross was supposed to be, having been excavated, three crosses were discovered at a great depth below the surface; and with them, though not attached, the Title that had been fastened to our Lord's Cross. The doubt as to which of the three Crosses the Title belonged was removed by a miracle. After having prayed to God, Macarius, the Bishop of Jerusalem, applied each of the Crosses to a woman, who was afflicted with a dangerous malady. The first two produced no result; the third was then applied, and the woman was restored to perfect heath. The Holy Cross being thus found, Helen built a magnificent Church in Jerusalem, in which she placed a portion of the Cross, enshrined in a silver case; the remaining part she took to her son Constantine, and it was put in the Church called Holy-Cross-in-Jerusalem, which was built on the site of the Sessorian palace. She also took to her son the Nails, wherewith the most holy Body of Christ Jesus had been fastened to the Cross. Constantine passed a law, that from that time forward, a cross should never be used as an instrument of punishment; and thus, what hitherto had been an object of reproach and derision, became one of veneration and glory. Both the Eastern and Western Churches abound in Liturgical compositions in honour of the Holy Cross. We offer our readers a selection from these, beginning with the glorious verses of Venantius Fortunatus. And by that death did life procure. Drown’d our offences in the tide. The royal purple of his gore! And ev’ry sinner’s crimes efface. Who conquer by the cross below. Amen. ℣. This sign of the cross shall appear in the heavens. ℟. When the Lord shall come to judge. From the Liturgical compositions produced by the Greek Church in honour of the Holy Cross, we select the following Canon, or Hymn, written by St. Theodore the Studite. This is a day of joy! At Christ's Resurrection, death disappeared, and life was seen in all its splendour. Adam, who rises again, exults with joy. Let us, therefore, rejoice and sing our hymn of triumph. The day for the adoration of the precious Cross has arrived. Come, all ye Faithful! It is exposed before us, and it sends forth the bright rays of Christ's Resurrection. Filled, therefore, with spiritual joy, let us embrace and kiss it. O Cross of my Lord, thy glory is immense! Show me now the divine face of thy beauty. Vouchsafe that I, who venerate thee, may sing thy praises. I speak with thee as though thou wert a living thing, and I embrace thee. Let heaven and earth unite in singing its praise, for the most holy Cross is shown to all,—the Cross on which Christ was fastened and sacrificed. Let us joyfully approach and kiss it. The saintly Moses of old prefigured thy Cross, Christ, when, dividing the waters with his rod, he led the Israelite people through the Red Sea, and sang a canticle of praise to thee in celebration of the going forth from Egypt. Thy Cross, O Lord, which we kiss to-day, was prefigured by Moses, when he stretched forth his arms; by it, we put our spiritual Amalec to flight; by it, also, we are saved. To-day, there is joy in heaven and on earth, because there shines upon the world the sign of the thrice blessed Cross. Its sight is a source of unceasing grace to us. What return shall we make to thee, O Christ, for thy having permitted us to adore thy venerable Cross, on which thy most holy Blood was shed, and to which thy Flesh was fastened with nails? We kiss it, and give thee thanks. The Angelic hosts exult with joy, because of the adoration of thy Cross; for on it, Christ, thou woundedst the demon troop and savedst mankind. The Church has been made a second Paradise, which, like the first, possesses a Tree of Life,—thy Cross, O Lord,—by whose contact, we are made immortal. The prophecy of the Psalmist is fulfilled: for lo! we adore the footstool of thy divine feet,—thy venerable Cross, the much loved Wood. The Wood, which Jeremias saw put in thy bread, is thy Cross, O merciful Redeemer! We kiss it, and honour thy Chains, and Tomb, and Spear, and Nails. On this day, a sweet fragrance is exhaled from the thurible of heaven,—the Cross, perfumed with a life-giving ointment. Let us inhale its heavenly wafted breeze; let us ever venerate it with faith. Tell us, O Eliseus! what is the Wood thou didst put in the water? It is the Cross of Christ, which drew us from the depths of spiritual death. Let us ever venerate it with faith. Jacob, of old, prefigured thy Cross, O Christ, when he adored the top of Joseph's mysterious rod. He foresaw that it was to be the venerable sceptre of thy kingdom. Let us now adore it, with ever faithful hearts. The great prophet Daniel, when cast into the lions’ den, stretched forth his hands in the form of a Cross; he was saved from the jaws of the wild beasts, and for ever blessed Christ our God. Let all the trees of the forest sing a glad hymn, for on this day, they behold one of themselves, the Tree of the Cross, being honoured with kisses and embraces. This is the Tree whose head was lifted up by Christ, as holy David foretold. Rejoice and be glad, O Church of God, that adorest this day, the thrice blessed Wood of the most Holy Cross, round which the very Angels stand ministering in awe. Also Read – May 3, 2018: Ss. Pope Alexander, Eventius, Theodulus, and Juvenal. By the sign of the Cross, deliver us, O our God, from all our enemies. Behold the Cross of the Lord, fly you his adversaries: the lion of the tribe of Juda, the offspring of David, hath overcome.